One early winter’s morning, before anyone was awake, I went for a walk in the snow. For me, the wintery wonderland provides a unique chance to be alone with my thoughts and to do some deep reflecting and communing with nature. It’s a good time to just be. Henry David Thoreau would surely have approved. I quietly put on my cold weather clothes, slipped on my snow boots, and gently opened the front door. My face was immediately flushed by the icy air and the prickly like chilly tingle of blowing snow. 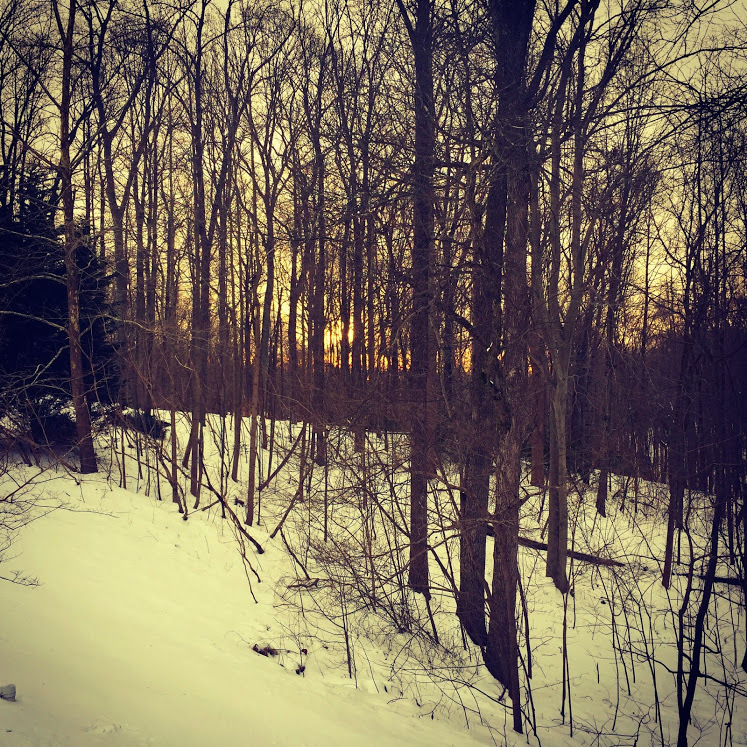 As I stepped off the porch into the snow, the sun was just starting to peer over the horizon. Its gentle caressing light pierced the air and shimmered the pale blue dawn with shades of soft amber. I could hear the wind gusts roaring through the tree tops. As I turned toward the woods, I could hear each of my footsteps as I tramped through the virgin white powdery snow. The air was sharp and crisp with the faint smell of wood from fireplaces. I walked into the woods and made way toward the stream. The snow was deep enough to keep my pace slow and deliberate. It was at this time, along this path to the stream, that I slipped into a semi-meditative state. My mind cleared. I began paying precise, nonjudgmental attention to the steady stream of impressions coming from all around me. It was calming and peaceful. I had drifted into a state of heightened self-awareness and total absorption in the present moment. I briefly lingered at the stream and listened to the gentle flow of the water over the rocks. I then began walking toward the road. My mind was quiet, relaxed, and clear; yet focused and engaged. I began to think about life and the meaning of it all. A philosophical mind like mine can wander across a vast landscape of ideas trying to find some kind of coherent and satisfying answer. But sometimes the best answers come from just being in the moment, from just letting go. After reaching the unplowed road I stood and took a deep breath of the cool moist air and looked up at the morning sky through the mists of my exhale. Thoughts and ideas flashed across my mind. The environment invoked awe and a sense of amazement and wonder. I thought of how many millions of other people over the centuries must have had similar thoughts while out on a quiet morning walk in the snow. Looking up at the millions of fading stars in the morning light made me think of just how mysterious it all is. I thought of just how impossible it seems that we (Man) will ever truly understand it all. An old philosophical argument sprung into my mind. How can a finite mind understand the infinite? The very concept of something being infinite in nature, always existing, never having a beginning, whether you believe it’s God or the universe or just matter, is almost impossible to conceptualize or understand for a finite, limited being who resides on a tiny little planet, amongst a sea of planets, in one universe amongst thousands of other universes. Man’s presence on this planet has so far been a mere blip in time. Vast infinite time existed before us and vast infinite time lies ahead when we’re all gone. Are we, as Conrad Aiken said, “Cosmic Mariners, destination unknown?” Or is this short journey of ours somehow the plan of some divine providence? Of course the simple truth is we don’t know with certainty either way. We know many small “t” truths about life and things. These can be answered mostly by science and reason. But we don’t have any sure answers for the big “T” truths about existence and the universe. Exactly how did conscious beings come to exist in a universe of lifeless atoms in the void? Having a scientific turn of mind, I can hypothesize and attempt to scientifically explain how this could have happened based on our current scientific understanding. But each possible answer I could give would only generate a number of philosophical and scientific questions that would cast some doubt on my scientific explanation. And so it is with every big “T” truth in life, we live and believe by faith, religious or otherwise. The secular-materialist may shudder at the idea, but they’re as much a faith community as religious believers are when it comes to the big “T” truths about existence. The great question of existence asked by Gottfried Leibniz still remains unanswered: “Why is there something rather than nothing?” Which brings me to an important understanding about faith. Genuine faith is always based on doubt. One commits oneself to an idea after having processed it, after having raised and analyzed doubts about it, after having applied it in the front trenches of life and found that the idea still lives and breaths. One rightfully has faith in such ideas. It has worked. It may not be “proven” true. More evidence may be needed to determine its truth. But despite these hesitations and doubts, one continues to live by the idea. That, my dear reader, is faith. “If doubt appears,” said Paul Tillich, “it should not be considered as the negation of faith, but as an element which was always and will always be present in the act of faith.” In the general sense, faith is that courage that allows us to live by possibilities rather than certainties. My thoughts were broken by the sound of a snowplow off in the distance. It was time to head back to the house. My wife and children would be getting up soon. I had enjoyed these brief moments of meditation and reflection and the chance to commune, Waldenesque like, with nature and the mystery. I cherish moments like these. We all need time to clear our heads and momentarily cast ourselves adrift in the flow of our thoughts. I would counter more “Jeffersonian” than Waldenesque. Your piece brought to mind the infamous letter from Thomas Jefferson to Peter Carr circa 1785. I say grab your gun and don’t think so much although given the infinite nature of time only a blip of a blip separates us from the Colonial Era and yet I must admit that seems a different time and place. That said my advice may be ill advised. Regardless, I thoroughly enjoyed venturing into the wood with you this morning…if only in spirit! Good point Eric. Jefferson was a nature lover and use to go for long walks — with his gun! — in the woods and hills of his estate, Monticello. I suspect Jefferson is a fellow wonderer in the annals of the Winter’s Morning Walk. I know that you’re a devoted nature lover, so I suspect you’ve had similar thoughts one crisp, cool morning walking in the woods in New York. Nicely said. I also find deep inspiration in wild places. There’s no better way to get our of yourself than to be reminded of the great, vast world of nature.